One of my favorite books when I was a little girl was Go, Dog. Go! I didn’t care about the girl dog with many hats constantly seeking approval or the fact that the dogs drove cars. What I loved about the book was the dog party, the idea that all kinds of dogs gathered together at the end to have a good time. 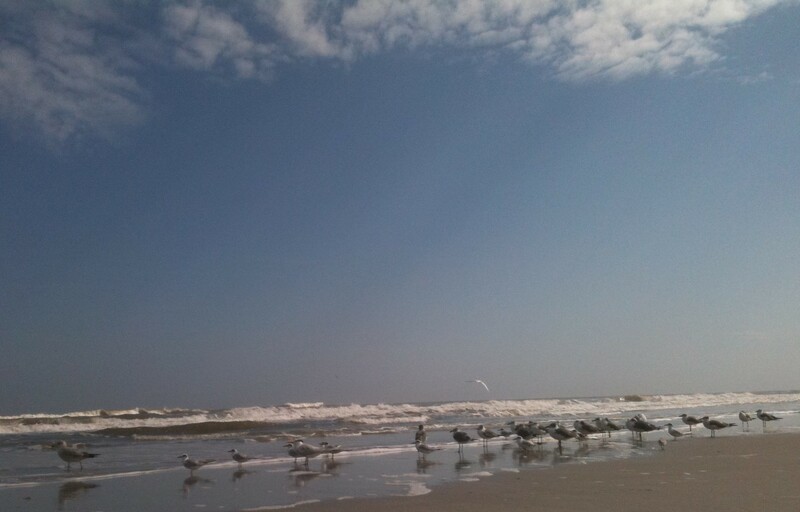 Walking along southern Jax Beach this past weekend I saw what I’m pretty sure was a bird party. Several kinds of gulls and terns, skimmers, and sanderlings often congregate together in large mixed flocks on winter days, when the beach isn’t heavily populated with people. Saturday’s above average warmth and abundant sunshine brought out a few extra bodies, but not enough to deter the birds and several flocks dotted the coastline, right where the water met the sand. But they were only half of the party. The real action was happening just offshore, taking advantage of a calm surf. More than a dozen pelicans were taking turns circling above, diving into the sea, bobbing about for a bit on the surface, and then taking off to restart the sequence. This is a common occurrence, of course, but on that day, the pelicans were diving and bobbing with large flocks of gulls and other birds, some diving occasionally as well but mostly floating in big groups that mirrored the ones on shore. In the sand and in the surf there was a lot of chatter, and the skies between were criss crossed with feathered friends winging from group to group, squawking their hellos and goodbyes or maybe spreading gossip. Whatever they were communicating it was evident that all those different kinds of birds gathered together in the sand, sea, and sky were having a good time.